I love traditions. I remember growing up that, every Christmas, we would travel to my grandparents in Pennsylvania. It was our tradition. Then we began rotating among the women (my mom, Aunt Lorraine, and Aunt Evie). It was a new tradition. After my grandmother passed away, the family didn’t get together anymore. In Secret Sister, Grace Beiler is faced with her first Christmas without her husband and with a splintered relationship with her children. She is lonely and lost, not knowing her place in the family anymore. Her husband always managed that. She is also trying to adjust to her new role in the community. From wife to widow. It’s a hard transition for anyone, but especially in a male-dominated society and without the benefit of a supportive family. Often when there is such a radical change, one that people think they simply cannot face or get through, they emerge victorious over the very situation they dreaded. When they once felt weakness, they learn to find strength. In fact, they develop into a new person. But isn’t that what life is about? Rebirth? Think about it. A person cannot be the same throughout his or her entire life. They must change and develop as they face the different stages of life: infancy, childhood, adolescence, young adulthood, midlife adulthood, mature adulthood, late adulthood. Grace Beiler is at that point: late adulthood. What Grace doesn’t know is that the last stage can be fulfilling. Someone else knows that and shows her the way. The only problem is that Grace doesn’t know who it is. She has a secret sister to guide her through the holiday and remind her that life is for the living. I encourage you to read the book and share your thoughts about the transition in Grace Beiler. Join us on Tuesday night at 8:30pm EST for an online book discussion (http://www.facebook.com/fansofsarahprice). And, if you know anyone that is in the midst of such a transition, consider gifting Secret Sister to this person. It might help them with their difficult journey. P.S. 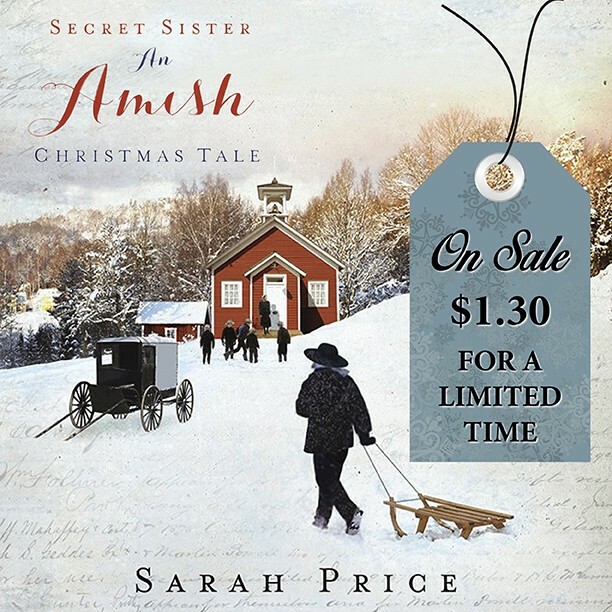 A special thank you to my publisher for discounting the ebook version of Secret Sister: An Amish Christmas Tale. I enjoyed secret sister. I can relate to her very much as my husband passed away on December 23, 2013 unexpectedly of a massive heart attack. Only difference we had adopted our granddaughter she was 6 at that time. I would recommend reading secret sister to anyone I to tend to want to stay within myself a little much. Secret Sister is a love story, if ever I have read one !It speaks to love of God, love between husband and wife, love between children and parents, ( and the struggles therein), and love between friends. Another of Sarah Palins’ great works !